If you're planning to buy a condominium, you're probably not going to stay in your new home very long. More than half of all condo buyers move out in six years or less, according to the National Association of Home Builders. Less than a third of single-family homeowners leave that quickly. So buying with an eye on resale potential is critical for anyone in the condo market. Just because the condo meets your needs doesn't mean it will be easy to sell when the time comes. That's why you need to consider the location, layout and amenities that will appeal to future potential buyers. These 8 smart moves will help you think through these issues so you can buy a unit that will sell quickly for a profit. Smart move 1. Understand your product. Affordable housing in otherwise unaffordable locations. A home with fewer maintenance demands. Convenient access to public transit, employment, entertainment and shopping. You'll want to purchase a property in a high-demand location that appeals to young and old and that is priced far below the single-family options in the area. 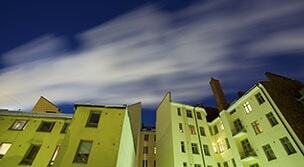 Avoid buildings with tons of amenities and luxuries that drive up homeowners association fees. The high fee is a turnoff to people who don't plan to use all of these features. Smart move 2. Go for lots of bedrooms. The more bedrooms you have, the easier a condo will be to rent or sell. In most markets, a larger condo (based on total square feet) is less attractive than a smaller condo with more bedrooms. Just make sure that extra bedroom is legally considered a bedroom. A den or loft probably won't count. There's one big exception to this rule. In some big cities, studios and one-bedrooms are more popular. Talk to several local real estate agents to learn what's in demand where you want to live. Smart move 3. Know what a good layout looks like. But avoid awkward layouts that reduce usable space. For example, a long hallway can occupy a significant amount of a condo's square footage. Angled walls that create irregularly shaped rooms can make furniture placement difficult. And pillars and columns reduce usable space. Interior bedrooms that don't have windows are also unappealing. Also look for units with at least one-and-a-half baths, so guests can use a separate bathroom. And if that extra bathroom isn't too close to the living or dining areas, guests will be more comfortable. Smart move 4. Consider the unit's location within the building. No one wants the unit next to the elevator, which means extra noise from people coming and going, or next to the smelly trash room. If all you can see outside the window is another condo or the trash bins in the alley, your unit will be less valuable than a unit with an attractive view. In general, you want your unit to be near — but not on top of — the building's amenities and parking. You want the convenience without the noise. A unit with a pool view might seem ideal until you realize how well the splashing and hollering sounds travel to your unit. Smart move 5. Know that different floors have different values. In general, an end unit or a top-floor unit is more attractive. Fewer shared walls means less noise from neighboring units. That being said, higher-floor units aren't always better, especially in a building without an elevator. Property values in walk-up buildings may be lower for units on the second floor and above because access is more difficult for some people. Buildings with elevators open up higher floors for these residents. However, elevators can mean higher condo association fees, since they cost more to maintain and repair than staircases. Smart move 6. Location and competition matter a lot. Purchase your condo in a high-demand area near major highways, public transit lines, shopping and dining districts, and tourist attractions. Avoid fringe areas and neighborhoods that are dense with condo developments. Ideally, you want to be located near single-family residences. Compare the amenities in the complex you're considering with those in nearby buildings. Will your unit stand out in terms of what it offers for the price? Finally, keep in mind that if new units are built after you buy, they will be more desirable than your older one. Construction cranes down the block are a bad omen. Smart move 7. Make sure the unit has guaranteed parking. Covered and gated parking is a highly coveted feature. Garages with cameras are especially appealing, as they provide extra security. A unit without guaranteed parking may cost less up front, but it won't seem like such a great deal if you can't sell quickly and for top dollar when you're ready to move. No one wants to circle the block 20 times to find street parking at the end of a long day. Smart move 8. Know the in-unit amenities that matter most. Units that let in lots of natural light are more attractive, as are those with outdoor space, such as a patio or a balcony large enough for grilling and entertaining. Abundant closet and storage space, as well as in-unit washers and dryers, are also big selling points. Bathrooms with exhaust fans and tubs (not just showers). Kitchens with pantries, a place to eat and high-end counter tops — no laminate or tile, please. As condos become more popular with older buyers, look for units with senior-friendly, extra-wide doorways and halls, nonslip flooring, an entrance without steps and plenty of lower kitchen cabinets.